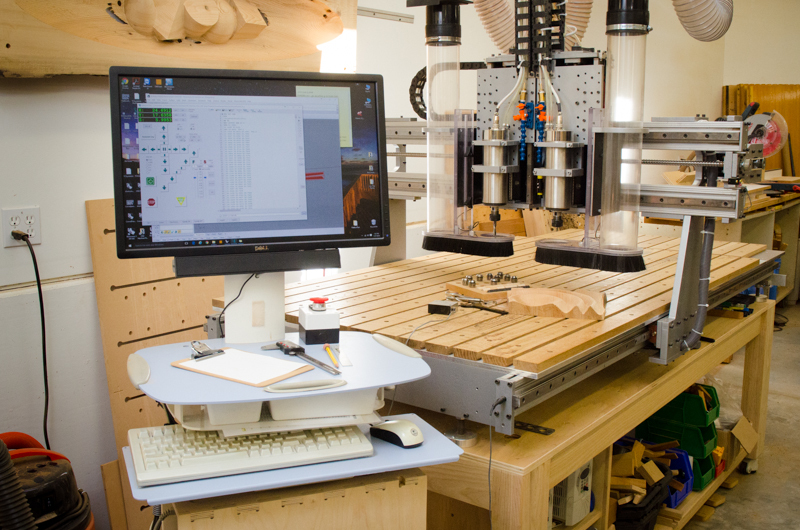 How does a woodworker get started so that they can utilize the benefits of a CNC? A good first step well before you buy a machine or utilize a CNC service is get the software you’re going to need and learn to use it. So how to get started? Naturally, you’re going to need a computer and some kind of design software even if you don’t own a CNC. The kind of design software you’ll need is what’s referred to as vector based. What this means is for example if you’re drawing a simple box the program as a set of instructions that describe the box rather then just a pattern of pixels. The software of choice to use on a CNC is a CAD (Computer Aided Design) program. CAD is essentially drafting software for a computer. There’s a number of inexpensive CAD programs for both the Mac and PCs. One example I tried was TurboCAD. There are many others, of course. It’s got all the basics you need and a lot more. Woodworkers can get by on some of the basic levels of any CAD program as all we’re actually doing is simple drafting. A better choice is to invest in a midlevel 3D CAD software package and learn to use it. Over the years you’ll put a lot of time into learning and using CAD and the benefits of better programs like Rhino3D really pay off in a short amount of time. And, the added benefits of working in 3D really pay off when it comes to seeing what you’re building well ahead of time that you CNC out the parts. Alternatively, you could use other types of vector based software for simple jobs that you might have a service run for you. An example is Adobe Illustrator. Though it’s not designed for CAD work but rather graphic design work you can produce files that will result in CNC output. That’s what I did for many years. As a designer I was well versed in Illustrator and Freehand so when I needed CNC output I just drew up my plans in these drawing programs and had a vendor output my files into MDF patterns.